Long before he was (not) paying other people to draw Transformers and putting his own name on it, Pat "Michiyamenotehi Funana" Lee was producing his own "original" comics, which were really just rip-offs of existing anime titles: Ghost in the Shell became Darkminds; Akira became Neon Cyber; and Record of Lodoss War became Warlands. Second in command of the Dataran Horde, and "son" of Malagen, Aalok serves as the primary means by which Malagen plans to take over Warlands. Though Aalok is not a vampire lord, and thus not traditionally allowed to wield Dataran-battle magik, he is a deadly and cunning foe, and will stop at nothing to bring about Malagen's dream of conquest of the Eastern Kingdoms. Now, none of those names probably mean anything to you. 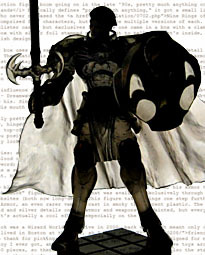 The first Record of Lodoss Warlands issue came out in 1999, and the last issue came out in 2002. It was done as a series of miniseries, so there were only about a year's worth of comics spread out in that time. Here's the short version: evil king of the vampires wants to conquer the world; Aalok is his dragon. That's all you need to know, because it's not like the plot held any surprises. If you know Record of Lodoss War, he's Ashram. Because there was an action figure boom going on in the late '90s, pretty much anything could have a toy. And since Warlands basically defines "pretty much anything," it got a small line from D-Boy (the same people who never released the Nine Rings of Wu-Tang toys). The line comprised four characters, but there were multiple versions of each. The normal figures were sold on blister cards, but exclusives like this one came in a box with a clamshell tray inside. It's a black box with silver foil stamped on the front to tell you what's inside, which is actually a fairly stylish design. The figure inside that box uses the same mold as the normal figure, logically. The detail is pretty good for the era, too. The anatomy is simple, but there's a lot of good detail on the armor. The bat or whatever on his chest is okay, but look at the patterns on his pauldrons - those are some really intricate fangs sculpted on there! There are etched symbols under the armor that could either be some sort of design element, or may just be Chinese for "left" and "right." The sculpt on the legs is soft, overall, and even the kneepads are less involved than the chest and shoulders. The head shows strong influence from the art of Pat Lee. Well, we're assuming Warlands was actually drawn by Lee - Dreamwave wasn't big and busy enough yet for him to need ghost artists, so the odds are good it's his. Since Aalok is part vampire or something, his skin is pale gray and his eyes are a dark red. His mouth is closed, so there's no dull surprise. Articulation is actually pretty good for those pre-Marvel Legends days. In 2000, a swivel neck, swivel/hinge shoulders, hinged elbows, swivel wrists, swivel waist, T-crotch, hinged knees and hinged ankles was fairly well top-of-the-line. The armor pieces on the shoulders and hips have hinges, so they move out of the way when you position the limbs, and the only real flaw is that, due to the design of the neck, he's perpertually looking down. Honestly, this is exactly on par with what ToyBiz and McFarlane were both doing at the time (before their two roads diverged in the yellow wood of toy manufacturing). 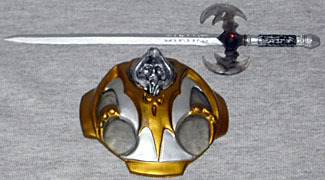 Aalok has two accessories: a sword and a shield. The blade is his Blood Sword - when Aalok is in battle, he draws the blood of his enemy through his blood sword and consumes it via a special channel in the handle of the sword; the more blood he consumes from his enemies, the more powerful he becomes. The shield has a simple L-shaped handle that can fit in either hand, and a figure of a hooded man on the front. His cape can be removed as well, with some work. So the normal Aalok is blue. 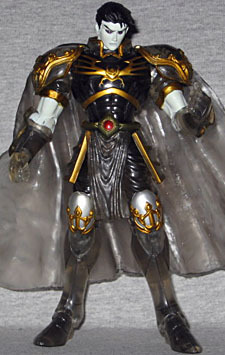 As mentioned above, when he absorbs enough blood, his armor turns black, which is what the "Dark Aalok" figure represents - that was available exclusively through the Dreamwave and D-Boy websites (both now long-dead). This figure takes things one step further: this is Dark Aalok in Crystal Armor, an even rarer variant cast in smoky translucent plastic. The skin is alabaster, and the gold and silver details on the armor and weapons are painted, but everything else is semi see-through. It's actually a cool effect, especially on the sword. 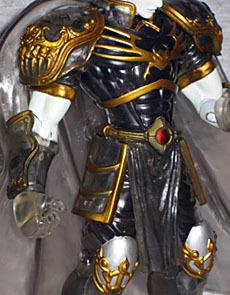 Crystal Armor Dark Aalok was a Wizard World exclusive in 2000, back when that meant only one thing: Chicago. Of course, I lived in Boston at the time, so I have friend of the site Mr. Stacey to thank for picking up this figure - he even got the box signed for me! 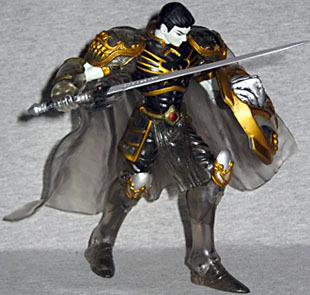 It's the only Warlands toy I ever got, and one of the earliest convention-exclusive toys around. Aalok was limited to only 750 pieces, so there aren't a ton of him around, but he's also the star villain of a forgotten series, so there isn't a ton of demand, either. It's not a bad toy, especially for a decade ago, but the "Crystal Armor" design makes it just a bit cooler.